At Ground Effects every wedding is designed according to the tastes of the bride and groom. Leah would love to help make your wedding and reception reflect your uniqueness. No request will be overlooked on your big day. We assure you our services and products will go above and beyond your expectations to make your wedding truly one of a kind. First: Set up a consultation with your preferred florist. Second: Have your wedding date set and venue reserved. Third: Bring your inspiration pictures and color scheme. It’s okay if you have multiple color ideas, your florist can help you work through them. Fourth: Have a general idea of what you would like your florist to provide and your budget. Please refer to our budgeting tips for an idea of general cost (scroll down). At Ground Effects Weddings, the first consultation is completely free. Following your meeting, Ground Effects will email you an estimate based on your conversations. To book Ground Effects Weddings, we require a deposit; it will be applied towards your final bill. Plan ahead to ensure you get your wedding on our schedule. Effects Weddings help you do both! On average, plan for your flowers and decorations to be about 10-20% of your overall wedding budget. In-season flowers will definitely save on costs. Some flowers have similar looks, but cost less. We can help you select low-cost alternatives for your “must-have” look. It may seem obvious, but the more people in your bridal party, the more your wedding party flowers will cost. The same goes for adding reception tables and decor. propose a detailed list of your costs. You can review it and adjust your order as needed. If you love the look of large centerpieces, but don’t want to spend that amount per arrangement on every table, we have a solution. By alternating between large and a few more modest arrangements you’ll maintain your look, but pay much less. Leah's passion for flowers started as a little girl. She planted her own flower garden as a child and would create bouquets for her mother. 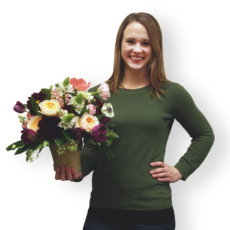 Now, with over ten years in the floral industry Leah has become a distinguished floral designer in Northwest Iowa. "Helping brides achieve their dream wedding is one of the most rewarding aspects of my career", she says. Her favorite thing to do for her clients' weddings are the centerpieces; it's where everything comes together! Leah was easy to work with and made things very simple for me since I know absolutely nothing about flowers. My bouquets and arrangements were more perfect than I could've imagined! I can't wait to get more arrangements from her just for fun :) Flowers are expensive, but I couldn't have imagined my wedding day without them—they were worth it! Leah was beyond amazing to work with. She was very well organized, brought attention to small details that I had not even considered and made incredible bouquets for our wedding. I received numerous compliments on how beautiful the flowers were and how they went so well with our theme. Leah did an amazing job and I would highly recommend anyone wanting flowers for their wedding to go through her. You will not be disappointed! Our flowers for my wedding were gorgeous and looked just like I envisioned! Leah was so helpful, easy to work with, and worked with our budget! We received so many compliments!